Jonathan Matthews in Pool Play 2.0. Photo by Maria Baranova-Suzuki. BOTTOM LINE: A newer version of a previous work that is an enjoyable immersive theatrical meditation on the role of “the pool” in our everyday lives and the complexity of the human experience. Three years ago, I had the pleasure of seeing This is Not A Theatre Company's production of Pool Play and I absolutely loved it. When news came that this scrappy theatre company was headed back into the pool for Pool Play 2.0, I dove at the chance to see this joyful production again. To my surprise, Pool Play 2.0 is not simply a remounting of the previous production. With the exception of one returning cast member, a new cast of wide eyed artists dip their toes literally and figuratively into the pool at Waterside Plaza. Some of the scenes have been tightened and there are more water ballet segments that are sure to bring smiles to the audience, who sit all around the edge of the pool that serves as the stage. That's right, the bulk of the action takes place in an actual pool and the audience sits with their feet dangling in the water so as to get an up close and personal experience of all the splish-splashing action. If you're thinking, "That's not for me. I might get wet," don't worry. Ponchos are provided, but aren't necessary. You might get splashed a little, but loosen up—you're seeing a play at a pool for goodness sake. There are limited number of land seats for those who are less adventurous or don't want to sit on the ground for 70 minutes. This production has a similar premise to the original Pool Play. As I described in my review of that version: Pool Play "explores water and our relationship with it. While there is not a traditional narrative, the cast and creatives piece together vignettes about wealthy pool owners, small town pools, segregated pools, training for competitive swimming, a snarky fish who think that he is better than humans, synchronized swimming, games of Marco Polo, musings on discovery and our place in the world, and many more to transport the audience back to a time where the pool, and water in general, offered endless possibilities and wonderment, and how we can still find that childlike wonder today." While I was hard pressed to single out any of the actors in 2014, I have to give major kudos to one member of version 2.0. Kim Ima gives a subtle, nuanced performance; her skill and grace alone is worth the very affordable $30 ticket price. Ima nimbly navigates the unknown shores of human existence as she tries, in several monologues, to simply cross from one side of the pool to the other in a raft with a single oar. Her heartfelt, vulnerable delivery, under the smart direction of Erin Mee, has you laughing one moment and on the brink of tears another. Its hard to bring such brevity and understanding to a line such as "This is Pool," but when Ima utters these words after a bittersweet story about one man's devotion to the community of the pool on the eve of its demolition, we understand the fragility and unpredictability of the human experience and the role that community and dedication play in keeping the tapestry of humanity together. Ima is definitely a talent to watch. Jonathan Matthews, who does double duty as choreographer and performer, is also a delight. 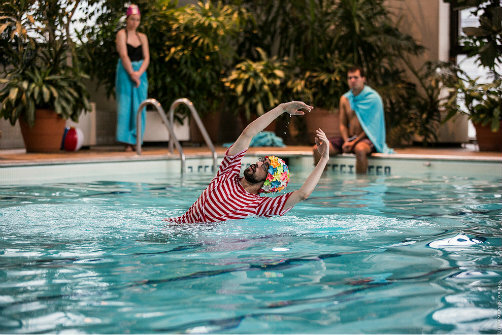 He creates joy-filled water ballet interludes that evoke more of a feeling of performance art, but are well at home in Pool Play 2.0. The entire cast dives in with unabashed gusto to tackle the Busby Berkley-inspired larger ensemble numbers, while Matthews channels his best inner Esther Williams in his buoyant solos. With a brisk run time of only 70 minutes, Pool Play 2.0 feels less like a play and more like a performance art piece. Don't let that scare or deter you. I know performance art can get a bad rap with some, but Pool Play 2.0 is even more successful than the original in creating a sense of community. With the simple choice to stage this version completely in the round, the audience is forced to take each other in as they watch the action unfold. With heartfelt scenes, songs, dances, and moments of pure joy, the audience shares a communal moment of pathos that is refreshing in this crazy world. Gathering together around a pool, an object that has brought people together for centuries, allows for a break from the everyday, where we can perhaps think about what it means to be human, and more importantly, have a great time. If you're looking for something that's not your typical Friday or Saturday at the theatre, run to see Pool Play 2.0. It's a spirited break from reality that is smart, refreshing, and extremely well done. Pool Play 2.0 is directed and conceived by Erin Mee, with text by Jessie Bear and Charles Mee. Choreography is by Jonathan Matthews. Stage Manager is Sophia Lana Cohen Smith. The cast is Trinity Bobo, Carol Brown, Ashley Wren Collins, Kim Ima, Caiti Lattimer, Jonathan Matthews, Chris Moriss.